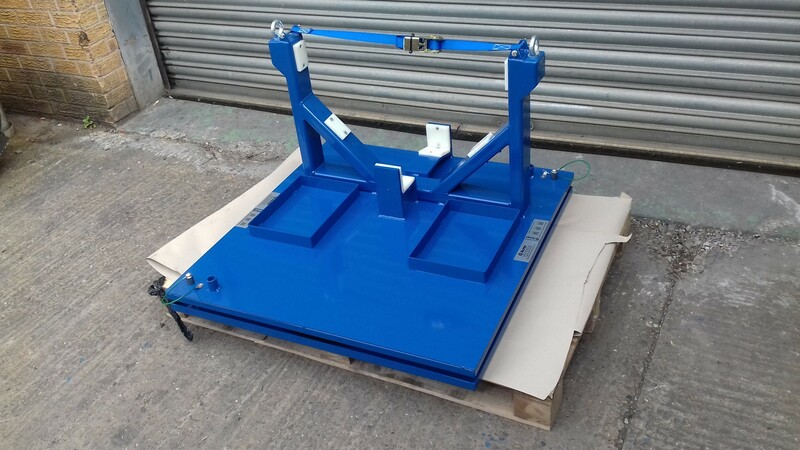 The RRT085297 – Rotating Pallet has been designed for a local midlands based aerospace client to suit aerospace machine tools used in the build process of gas turbine engines. The design enables the client to safely store and access the machine tools with limited space. The main framework has been manufactured using 25 x 25 box section with a thin wall to provide an optimum strength vs weight solution. On top of the box section there is a mild steel sheet which the part locator and the tool trays are welded to. The base of the pallet features a turntable ring which is bolted to a formed mild steel sheet allowing the top section to rotate 180 degrees. This provides easy access to the tooling while taking up a smaller work area. To lock it in position index pins will drop into a hole on the base section of the turntable ring. White Nylon pads cover all contact areas to prevent any metal to metal contact and limit heavy wear. Ratchet straps secure the tooling to the pallet. The unit has been powder coated in Blue BS 4800 20 D 45 to provide a hard wearing, long lasting finish.